Good value home cooked food has been the motto of the family who have run the Acropolis Cafe Bar since 1976. Free Delivery service in the Cathedral Quarter, Telephone orders welcome. Available for Private Functions, Please check availability and Offers. All Fresh local produce. Although the menu may have changed over the years one thing that hasn’t changed is the friendliness of the staff, including the owners Kevin and Christina Murray. The staff will assist you in every way possible from making sure you are seated and comfortable to going through the menu and discussing any special requirements you may have. The current menu offers our famous breakfasts of which come in varying sizes, homemade fayre such as Steak and Kidney pies, Lasagne, Curries and more traditional dishes like Braised Steak and Liver and Onions. We also do a special menu for senior citizens which includes a variety of meals with a drink and a slice of bread and butter. 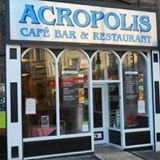 Acropolis caters for the whole family and so children are very welcome. Whether it is a drink you are after (maybe be one of our coffees or teas from around the world) or a meal you will always be made very welcome. With 140 seats inside and 40 chairs outside in the Market Place we can cater for parties of most sizes. OAP SPECIALS – Fillet of Fish, Liver & Onions, Pie of the day, Salad of the day, Breakfast, Sausage Casserole, Roast of the day all served with a slice of bread & butter and tea or coffee.